• Thursday 22nd December, or Friday 23rd December with a Saturday guarantee. Online shopping is great for Christmas; you can slot it into the spare minutes between nativities and card writing, especially if you have a smart phone (ideal for mums on the go). But don’t think you can get away with adding to your basket at the last minute like you do the rest of the year – online shopping has its deadlines too! 40 million of you do your shopping online for gifts, which is no surprise considering the choices available and the ease of shopping from your own home. But don’t hang about and end up missing out on receiving your items in time to wrap and send them. Order by 11.59pm on Sunday 18th December for free super saver delivery. • By 11.59pm on Wednesday 21st December for first class delivery. • By 6.00pm on Friday 23rd December for express delivery. • By 3.30pm on Friday 23rd December for Amazon Prime customers. 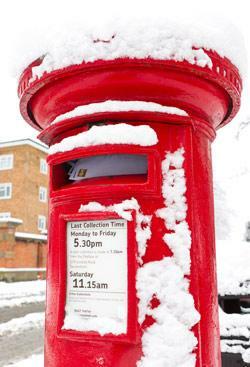 • Customers in some postcodes can order by 8.30am on Saturday 24th December and get an evening delivery. Order by Wednesday 21st December for smaller items (for delivery by Friday 23rd December). • By end of Sunday 18th December for larger items, such as furniture. • Close of business on Christmas Eve for in-store pick up through its check and reserve service. Order by Thursday 22nd December for next day delivery. • By Monday 19th Decmeber for standard delivery. • Order by 11.59pm on Thursday 22nd December. • Order by 3.30pm on Friday 23rd December. • Order by 11.59 on Thursday 22nd December for collection in-store as well as home delivery. • Order by Monday 12th December for free delivery. • By Monday 19th for standard delivery. • By 5pm Thursday 22nd for express delivery. • Order by Monday 19th December for free delivery. • Order by 3pm on 21 December for gifts delivered within the UK. • By 7pm on 12 December for overseas delivery. • Home, clothing, beauty, gifts and entertainment order by 12pm 21st December for standard delivery. • Order by 12pm 22nd for nominated day. • UK (excluding Northern Ireland) courier order by 9pm Thursday 22nd December. • UK (excluding Northern Ireland) other carriers 9pm Friday 16th December. • Order by Tuesday 20th December for large items. • By 3pm on Thursday 22nd December for small items and clothing. • By 12pm on Thursday 22nd December for wine by the case.